Jesus never promised I’d be pretty. This I said to my husband as I looked at the gash on my face from a relatively minor skin cancer op. Then I put on my running shoes and headed out to run and think. I thought of all the things God never promised. He did not promise Adam and Eve they could do their own thing with no consequences. He did not tell Job there would be no trials in his life. He didn’t tell the Psalmist there would be no valley of the shadow of death. He did not promise the NT believers that they would not suffer tribulation. He did not tell the martyrs throughout the ages that they would not suffer for the gospel. He did not tell Corrie Ten Boom that her life would be persecution free. He did not promise Nate Saint that his mission to the Auca Indians would bear fruit in his lifetime. He did not promise us a hassle free, easy, perfect life. But He did promise to be with us- in the valley, on the mountain top, on the level path, even unto the end of the age. He promised to save us to the uttermost, completely and forever. He promised to always intercede for us; in fact, he ever lives to do this. He promised peace that passes all understanding. And he promised that when all is said and done our tears will be wiped away and we will live with Him forever. I love all the superlatives – the most, the best, the highest. Extreme promises. All the promises of God are yes, says the Bible. I like that. To which we say, amen . That means, by the way, another yes. A resounding unqualified yes……..
As is often the case when I run a song kept coming to my mind. .Ayuh, I thought as I finished my run. I think I’ll go find a stone or better yet many stones and emblazon upon them the promises of God. I could put them on my windowsills, bookcases, bedside stands, places where I can see them every day. But then I remember that God’s very words are already written on my heart. 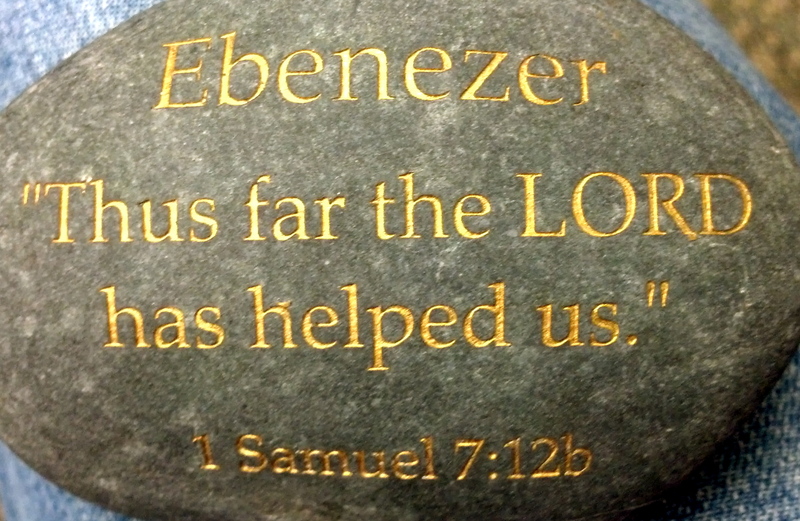 And that, my own personal Ebenezer, I raise.